Memorial Day was originally called Decoration Day and was initiated to honor the soldiers for the Union and Confederate armies who died during the American Civil War. The original celebration of Decoration Day took place on 30 May 1868. 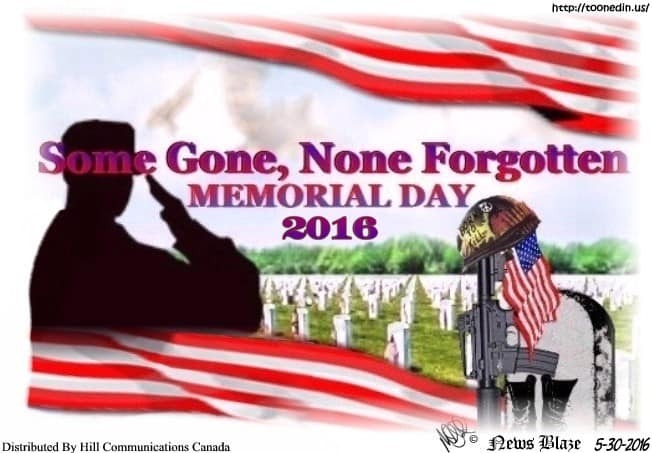 Memorial Day was eventually expanded to include the deceased veterans of all the wars fought by American forces. In 1971, Memorial Day became a federal holiday. When Memorial Day became a federal holiday, it was given the floating date of the last Monday in May. Every Memorial Day, the U.S. flag is quickly raised to the tops of flagpoles, slowly lowered to half-mast, and then raised again to full height at noon. The time at half-mast is meant to honor the million-plus fallen U.S. soldiers who have died for their country over the years. Re-raising the flag is meant to symbolize the resolve of the living to carry on the fight for freedom so that the nation’s heroes will not have died in vain. Michael Pohrer; Internationally Syndicated Missouri Animator / Cartoonist / Illustrator. Currently Newsblaze’s Featured Editorial Cartoonist, Editorial Cartoonist for The Global Free Press. Creator of FIDDLESTIX©, Welcome To The Jungle© and the new feature cartoon strip A Minute With Captain Obvious©. Spilling ink on drawing boards since 1979. Delivering daily funnies to the masses through the printed pages since 1988. Currently a member of SCCS Southern California Cartoonists Society – San Diego Chapter of The National Cartoonists Society, CAPS, Comic Art Professional Society, I.C.C. International Cartoonist Conspiracy, and The St. Louis Gateway Arts. The various animations / digital graphics / and cartoons produced at PC Studios can be seen throughout various media sources internationally such as The Global Free Press (Kingston, Ontario Canada), The Nashville Free Press (U.S.A.), Newsblaze Publications (U.S.A.), and Newropeans Magazine (Paris, France).Broadcast across network television through the MeTV Network, NBC Sports and NBC, available through Google News, included in “Best Editorial” compilations, Comic Books (U.K. and Britain) as well as anthologies, newspapers, magazines and exhibits in Galleries / Museums. Connect with Michael Pohrer on Google Plus.